Your dog is a real beast when he pulls the leash? 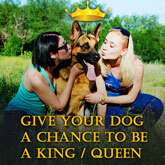 Dream of strong and reliable dog lead that will serve your doggy for many years? Stop wasting your money each 2 months for new leash - choose this Handcrafted Maxi Strong Dog Leash with Exquisite Braid. It is made of super soft and strong 100% full grain genuine leather and, thus, it is strong, reliable, long servicing and super gentle to your skin. It doesn’t cause allergy, skin irritation or rubbing during usage. The fittings are made of brass. Due to it they have amazing gold color and resistance to rust and corrosion. In order for this leash to be stronger and to serve your better, its edges are fixed together with brass rivets. Braided decoration can beautify any dog and add some luxury in your usual daily walks. Tired of wasting your money? The price of this leash is more than affordable! Treat leather material with water repellent and leather conditioner. They will keep its look and protect it from external influence, remove dust and dirt. Do not wash it with water. Hi Guy, Just a short note to let you know how pleased I am with my recent purchase of two 6 foot leather leashes. After many years of using leather, I had tried 3 different nylon styles. They just did not have the same feel I was used to. Fortunately I discovered your website, which had the style and construction of leashes purchased through trainers years ago. Both leases are very well made, and the weight is what I am comfortable with, the handles are starting to give a little now, and feel so comfortable around my wrist and hand. Thank you for a great product! I would also like to say that the cost was very reasonable, compared to leather leashes I had looked at in retail...and they did not have the brass clips or the twisted leather feature for strength. I plan to look to you in the future for other products. Sincerely. I received the order yesterday. Overall, I'm very happy with the leash. I had one similar to it for several years, and my 9 month old Airedale snapped it a couple weeks ago. Yours is a bit wider and appears much stronger. I don't expect this one to snap. Guy, I just wanted to thank you for the beautiful leather leash. It is much better for me to handle with my dog. Thank you. You guys always have great stuff that's why I have bought from you for years. I bought a male dog. My male is beautiful boy he's 16 weeks old today. Got him at 8 weeks so I'm sure will be buying him more goodies from you guys. Take care thanks for your e-mail I will keep in touch. Hi Guy, Just wanted to let you know that I safely received my dog leashes this morning and that I am very happy with them!! Thank you for taking the time you spent speaking with me to make sure these were made to my satisfaction! On the leather leashes I especially like that the "www.fordogtrainers.com" is embossed into the leather!!! You also made the nylon leashes exactly how I wanted, and I also like the rubber tag with the company name! I am sure I will be ordering from you again in the future! From: Kind Regards, Andy from UK. Hi Emma, I received the 2 leather leashes yesterday and I am very pleased with the quality. The order completely exceeded my expectations. Thanks. This is my third leash of this style. (Another Airedale owner, the first two leashes were eventually chewed through -- but not bad considering 20 years and three Airedales.) This leash is good looking, strong, and easy on the hands. The best I've found by far.